This article is part of my Etowah to Etowah in six hours series. One by one, these posts take you through our entire six hour loop. We came to the Indian Boundary Campground about a half hour after our stop at the Cherohala Skyway Visitor Center. 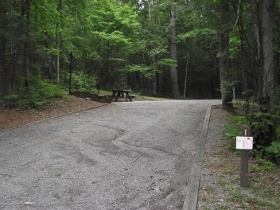 The campground is on a Forest Road and is about two quiet miles off of the scenic Cherohala Skyway. Ample signage on the skyway made the campground easy enough to find that even I was able to do it without problem. The name led me to believe that this would only be a campground. Not so. There are tons of things to do here. The campground is just a beginning point. 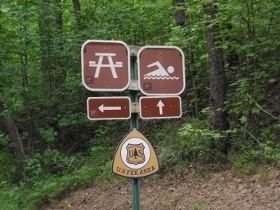 The Indian Boundary Recreation Area is probably about 2 minutes from the campground. The 96 acre lake has quite the reputation for bass fishing. If you aren't into fishing don't worry. There is also a lakefront swimming beach, boat launch and a second picnic area here. Since Indian Boundary Campground is part of the Cherokee National Forest the scenery is absolutely amazing. The Cherohala Skyway is one of the best kept secrets in East Tennessee. It is just as pretty as the Great Smoky Mountains National Park but seems to be less crowded. From the Indian Boundary Campground, it took us about another hour to get to the road construction on the Cherohala Skyway.